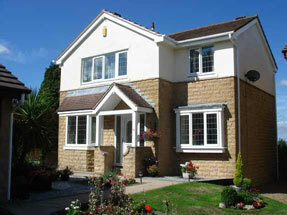 Carousel Double Glazed Windows Skipton is a family run business, established in 1991. For twenty years, we have been producing quality windows with a growing reputation for reliability and excellent customer service. Tellingly, most of our business comes from recommendations from previous customers. Because we're a family business with a reputation to keep up, Carousel Double Glazed Windows Skipton won't send round any high pressure salesmen. In fact, our company policy dictates that we don't actually have any salesmen, just great quality customer service dedicated to helping you with the important decision of which windows and doors will look the best in your house. As the choice of window or door is a choice that you'll be living with for many years to come, we want to help you make the best choice possible. So please take your time and ask us as many questions relating to your double glazing as possible. We're here to help you and the advice we offer is free. You'll probably be thinking what a big difference your new windows and doors will make to your home. But it's not only the obvious aspects that you need to take note of - yes, the uPVC casements we use will definitely improve the look and probably the value of your property, but there are lots of other less obvious ways that your new windows will benefit your home too. If you take a look at the profiles we use for our double glazed windows for example, our windows are made with the latest multi-chamber PVC-u which makes them prefect for keeping out the cold, draughts, damp and noise. Not only that, they'll also keep your home safe from unwanted intruders. You may just be investing in new windows for your home, but your whole home environment will benefit as a result. In most cases, your home is going to feel more secure, warmer, quieter and lighter too. Every window we make is bespoke, ensuring that it fits your window space perfectly. As we do this in our 4,000 square foot factory, the skilled tradesmen who measure your windows are directly in contact with the professional team who manufacture them, so the job is followed through from start to finish, tailor made to suit your needs exactly! What Carousel Double Glazed Windows Skipton have found out is that our clients want windows and doors that are manufactured and installed to the highest standards giving you years of trouble free service. Quality permeates everything that we do for our customers, from the service that we give our customers on the phone, to the materials that we use in constructing every window that we install in every house. Carousel Double Glazed Windows Skipton ensure very strict quality control measures throughout the factory as well, making sure that every procedure adds to the quality of final double glazed product.